On-the-road advertising ! It's the biggest, brightest idea ever to hit the streets ! no-cost, profit-making revenues from existing infrastructure. For Advertisers, the result is high-profile, effective marketing which literally drives business to their front door ! removing the advertisements and reinstating the surface upon contract completion. View our products and services video. 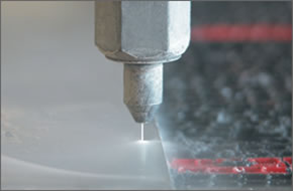 The latest waterjet cutting machines enable intricate designs, logos and text to be cut with precision from thermoplastic materials and heat-applied to asphalt and concrete surfaces.